Sign the petition to tell Walgreens that tobacco doesn’t belong on its shelves. Tobacco is the number one cause of preventable death in the US, killing more Americans every year than AIDS, alcohol, car accidents, murders, suicides, drugs, and fires combined. It definitely doesn’t belong in pharmacies, where people go for important health services, products, and information -- right? The vote would have been a step toward taking tobacco off Walgreens’ shelves, a move that CVS Pharmacy made in 2014. Except the Board of Directors went to great lengths – twice – to block the vote and remove the topic entirely from the agenda for the January 26 shareholders meeting. And they were successful. The longer it takes leading pharmacies like Walgreens to take this key first step, the longer people will be able to purchase harmful, addictive products behind the counters of health stores. Deadly products have no place “at the corner of happy and healthy,” and with your signatures, we’ll tell Walgreens that its customers side with the shareholders. 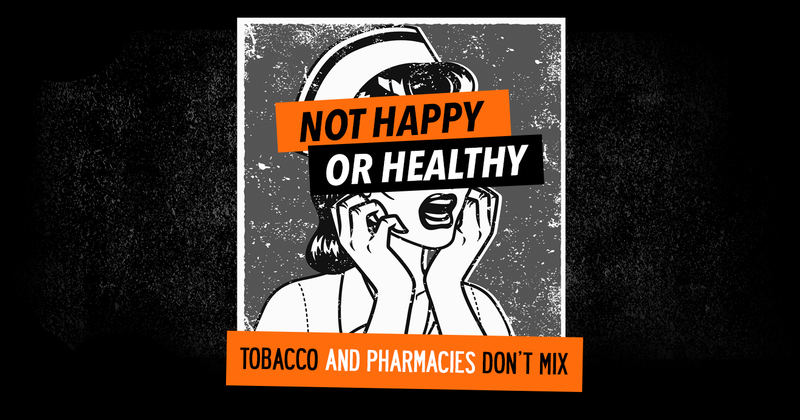 Speak up to let Walgreens know: tobacco and pharmacies don’t mix!